Not an “expert” gardener? Don’t worry – here is your guide to detailed planting, care & pruning information for the different plants available from Gardenland USA. We want your gardening experience to be a rewarding one! Follow the links below to find detailed information on planting, care and pruning for the plants you are interested in. Be sure to check your buying the right plant for your area. For information on zone hardiness, look here. Use the drop downs to research and compare different plants. They will lead you to the information you need to make an informed decision. You can follow link under each drop down to purchase once you have determined which plants will work best for you! When Your Roses are Delivered – open and check for moisture. If the roses appear dry – especially the roots, add water, then reseal the package till ready to plant. Roses can be stored at cool temps (34 – 42F) for up to two weeks. Planting – Find a sunny spot (at least 5-6 hours a day) with good drainage. Roses will eventually die if they are planted in a wet or soggy location. Before planting, soak your rose in a pail of water for 12-24 hours (be sure all of the roots and at least most of the trunk are in the water). This will hydrate the plant and keep them damp during planting process. Dig a hole 18″ deep and 2′ wide, (keeping your soil close by) add at least two shovel full’s of organic compost to this soil (If available, add 1 cup bone meal) and mix them well. Return 2 shovel full’s of the amended soil to the hole and form into a mound. Trim any damaged roots and place the rose on the top of the mound, spreading the roots down the side of the mound. 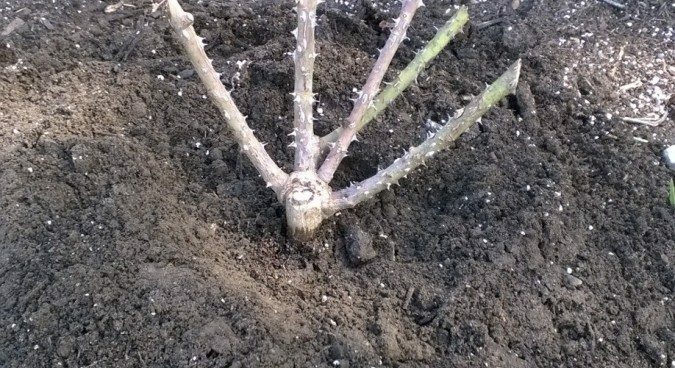 In coldest areas place the graft knot on rose 2″ below ground level and in warmer areas 1″ above ground level (use your amended soil to adjust height). Trim back the canes 1/3 to encourage new growth. Do not fertilize until you have 6″ of new growth! Deadheading – Once blooms have faded, it is helpful for maximum flowering to cut cane below spent bloom. Find the first healthy cluster of 5 leaves facing outside of plant and using sharp by-pass pruners, make a clean 45 degree cut no more than 1/4″ above the union. Pruning – To enjoy years of beauty and to encourage maximum blooms, proper pruning to your established rose is important for the following reasons. Make your cuts at a 45 degree angle and make a clean not ragged cut. Start at the base of rose bush and remove all broken, dead or dying canes. Try to open the center of the plant to allow air to circulate and light to enter. Remove any weak and crossing branches. Remove any “suckers” that are growing from below the root graft. Pruning Climbers – Prune in early spring before the leaves begin to bud. Cut away any dead or discolored canes. Remove lateral canes that cross the upright canes and will compete for light. Finally prune lightly for desired shape. When Your Potted Roses are Delivered – open shipper and remove your rose. If the canes appear dry – loosen wire tie and and add some water to pot, then reseal the bag till ready to plant. Roses can be kept indoors in well lit area or outdoors for several weeks. If keeping outdoors, try to protect from extreme heat (example – don’t place in full sun on concrete or pavement). This may damage any new growth that is starting. Planting – Find a sunny spot (at least 5-6 hours a day) with good drainage. Roses will eventually die if they are planted in a wet or soggy location. Before you plant the rose, remove poly bag and soak the entire pot in water for at least 2-3 hours. Dig a hole 18″ deep and 2′ wide, (keeping your soil close by) add at least two shovel full’s of organic compost to this soil (If available, add 1 cup bone meal) and mix them well. Return 2 shovel full’s of the amended soil to the bottom of the hole. Remove your potted rose from the water and score (cut) the sides of the pot in 3 or 4 places, also score the bottom of the pot. 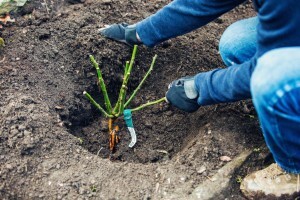 Place pot in hole with the graft knot on rose 1″ above soil level in warmer climates and 2″ below soil level in coldest climates (use your amended soil to adjust height). After pot/rose is at correct height, fill the hole 2/3 with the amended soil and pack lightly. Fill the hole with water and let it drain. Finish filling the hole with soil, making a mound around the hole to create a “moat” to hold water. Make sure the top of the pot is at least 2″ below the final soil level, if not cut it off. This will ensure the pot degrades rapidly and allows new root growth beyond pot walls. Fill moat with water and apply mulch, if desired, to help keep root area damp. (If mulching, do not mound mulch around plant like a volcano, keep mulch at least 1″ from rose trunk). Your rose was pruned prior to shipping. If there was any cane damage from shipping, cut back the damaged area far enough to create a clean cut. Do not fertilize until you have at least 6″ of new growth! When Your Shrubs Arrive – Open and check for moisture. If the packing material is dry, add enough water to re-moisten (without soaking). and reseal package until ready to plant. Your plants can be stored in cool temps (24-42F) for up to 2 weeks. Soak your plant for 20-30 min. before planting. Dig a hole 18″ deep and 18 — 24″ wide. Mix approx 1 part compost to 3 parts of the soil removed from hole. Return some of this mix to hole forming a mound. Spread roots over mound and place plant so that the shrub is about the same depth as it was in the nursery. Fill hole with your amended soil to within 2″ of the ground surface. Tamp soil firmly and fill hole with water and allow it to soak in. Finish filling hole to surface level and mulch with an organic mulch. Choose a sunny to partially shaded site to plant your beautyberry bush. When planting more then one in a group, spacing should be about 4-6′. Beautyberries don’t require much pruning. The shrub has an open form and the branches naturally droop down when weighted with berries. They bloom on new wood so pruning carefully for shape if desired is best done in late winter. Shearing at a desired height is not recommended as it leads to an unattractive growth habit. Beautyberry prefer a fairly deep weekly watering in the first few years till well established; although they can endure short periods of drought. Pick a spot with full sun to partial shade; they thrive in rich porous and somewhat moist soil. For bluest color, in the Spring, use a soil treatment for acid loving plants as per directions. During the first year you should water regularly, especially during dry conditions. Your hydrangea will set its flower buds on old wood so its best to avoid trimming for shape or size after August 1st. To thin out an established plant, remove 1-3 of the oldest branches at ground level in late winter or early spring. You should also remove dead or broken branches at this time. In colder zones, it’s best to cover your plants with a layer of bark mulch, loose pine needles or straw. Pick a spot with full sun to partial shade; they thrive in moist, rich and well drained soil. Make sure the crown (where the stem meets the roots) is placed just below ground level. Planting too deep can cause the roots to rot. During the first year you should water regularly, especially during dry conditions. This very adaptable shrub is fast growing with a growth rate of 25″ or more each year. Because PG Hydrangea forms flower buds on new growth, the best time to prune is winter, however it can be trimmed in the early spring or fall with care. Choose a spot with full to partial sun and with good drainage. This is important because hibiscus syriacus do not thrive in very wet locations. You should however water 1-2 times a week during dry weather. Once established you can fertilize each spring with a general purpose fertilizer or an organic mulch. Althea will bloom on new growth so they respond well to an annual pruning in late winter or early spring. Proper pruning will promote new growth and larger flower size. Do not be afraid to keep your plant pruned to a smaller height, this will promote larger flower blooms. When trimming mature plants, remove about 1/3 of the wood each year, concentrating on older growth. Cut dead and diseased branches back to the base of the shrub. Plant your lilac in full to partial sun of at least 6 hrs. They will not bloom well if they don’t have enough sun. Lilacs thrive in well drained fertile soil. If your soil is in poor conditions, adding compost will help. When planting in a hedge, space about 5-10′ apart. To improve flowering, keep grass from growing around them. Once established, lilacs do not need to be over fertilized as this can prevent them from blooming. Lilacs bloom on old wood, so pruned in the late spring after they have bloomed. Each year, remove any dead wood. Once established, remove 1 or 2 of the largest canes to the ground each year. Smoke bush prefers fertile well drained soil. Provides the best show in full sun. For the first few years, keep soil slightly moist by watering frequently during times of drought and intense heat. With minimal pruning it will form a large shrub or small tree of about 6 – 8′. Left untrimmed it will grow to 15′ by 15′ wide. Pruning should be done in late winter or the early spring while the plant is mostly dormant. General pruning will include removing old, diseased, broken or dead wood. Any crossed branches should be removed to prevent crowding and rubbing. Keep in mind, the plant flowers on 2 yr. old wood. TO PRUNE AS A TREE: Start young and remove all the extra stems, leaving only one strong central leader. Control all sucker growth from around the base of the plant. You can shape it as this grows. TO PRUNE AS A BUSH: You may allow the extra branches to grow and prune to manage the desired shape. The natural spreading nature of the growth can be controlled through proper pruning. When removing any of the large main trunks from mature plant, always cut to the base. Small unproductive twigs and branches should be removed from the center to create air flow and allow established wood to grow and bloom. Prefers a location with full sunlight. When planting as a hedge, plant about 4′ apart. No pruning is needed for the first 2-3 years. Once established, pruning after it flowers is the most widely used method. Cut out about one-third of the old woody growth. This encourages new growth which will supply the next season’s flowers. Look for quickly growing whip like growth, this should be cut off at about 15-18″. Once established your forsythia can usually go several years between these prunings. Once established, forsythia be fertilized twice a year, once in early spring and again in early summer. A fertilizer high in phosphorous can promote bright blooms. Do not fertilize in the fall or winter. Well thrive in full sun to partial shade but for intense red fall color, choose a sunny location. This low maintenance plant require little care once established. Trim any broken, dead or diseased branches anytime. Other then that, your burning bush should not require much trimming at all. Any little shaping should be done in the early spring. Prefers full sun for best flowering. Tolerant of most soil types and will thrive in all but the wettest locations. When choosing spot, remember they will reach up to 6′ so its best to place behind smaller shrubs if you are planting in a grouping. Buddleia do not require much fertilization, if you have good soil, a light organic fertilizer is fine. Once established your butterfly bush will be drought tolerant and require very little watering. If you are growing your plant in a container, more watering will be required. If you are located in warmer zones (zones 6-8) and your butterfly does not die back during the winter, its best to prune annually to prevent overgrowth and promote flowering on newer wood. Wait till early spring and remove several of the heaviest stems to the ground. The remaining stems can be pruned back to approx 1-2′. When Your Perennial Plants Arrive – Open and check for moisture. If the packing material is dry, add enough water to re-moisten (without soaking). and reseal package until ready to plant. Your plants can be stored in cool temps (24-42F) for up to 2 weeks. Dig a hole 18″ deep and up to 18″ wide. Mix approx 1 part compost to 3 parts of the soil removed from hole. Return this mix to hole filling at least half way forming a mound in hole. Prefer a sunny (10+ hrs) well drained location. Avoid windy locations if possible because the tops may break when in bloom. Place peony roots with eyes facing up in hole prepared as above and finish filling with soil mixture so that eyes on root are not more then 2″ from final surface level. Water well then add 2″ of an organic mulch. Prefer a shady or partially shady location with good drainage. Place your Hosta in hole prepared as above and finish filling hole ending with root crown about 2″ below final surface level. Water thoroughly and add 2-3″ of an organic mulch. Need good drainage, they will not thrive in water logged locations. They prefer shade or partial shade but can manage full sun in northern areas. In warmer climates they MUST have at least partial shade. Place in hole prepared as above with roots pointing downwards and finish filling hole with the eyes resting about 1″ below final surface level. Water thoroughly and add 2-3″ of an organic mulch. In late summer the tops will start to die back – DO NOT REMOVE until they turn yellow or brown. Do best in full sun and prefer good drainage. Place in hole prepared as above with roots pointing downwards and finish filling hole with the root crown laying about 1″ below final surface level. Water thoroughly and add 2-3″ of an organic mulch. Will tolerate most any soil. Prefer full to partial sun. Place in hole prepared as above with roots pointing downwards and finish filling hole with root crown laying just below surface. Water thoroughly and add 2-3″ of an organic mulch. Tough and easy to grow, it survives in just about any sunny location. It prefers average to dry well drained soil in full sun; it does not do well in wet soggy soil. When Your Packaged Perennial Plants Arrive – Remove from shipping package and check for any damage to poly bag protecting root and media. If you do not plant within 1 week of receipt, check media surrounding root for moisture. If dry, add enough water to re-moisten without soaking. Your perennial can be stored indoors for several weeks. If storing outdoors, try to keep from excessive heat (as an example – do not store in direct sunlight on concrete or pavement). When Your Clematis Vine Arrives – Open and check for moisture. If the packing material is dry, add enough water to re-moisten (without soaking). and reseal package until ready to plant. Your clematis can be stored in cool temps (24-42F) for up to 2 weeks. Planting – Select a location with 4 to 6 hours of sunlight a day. Clematis prefer rich loamy soil. Dig a hole 18″ – 24″ deep and up to 18″ wide. Mix at least 1 part compost to 3 parts of the soil removed from hole. Return this mix to hole filling most of the way forming a mound in hole. Spread the roots and plant vine with at the same depth as previously grown. Water well. Care – Support the plant as clematis prefer to have their tops and leaves up in the air and light. They prefer cool roots, so mulch the area well. Another option is to plant perennials or annuals around the base of the plant. Apply fertilizer once or twice a season. In extremely dry weather, make sure to keep plant water and roots cool. Pruning – To keep your clematis looking its best, annual pruning is suggested. There are 3 basic pruning groups. Your can find this information in the product description of the clematis varieties you purchased. Group 1) These early spring boomers should be pruned back as soon as they are done blooming. This should be done before July. These clematis bud on the previous years growth so you want to get rid of the old and let the new growth start. Group 2) These typically large-flowering types should be cut back to the topmost healthy buds in late winter or early spring. These clematis will flower on the remaining buds in mid spring. Group 3) These later blooming varieties should be pruned back in late winter or early spring. This group should be pruned hard (removing 2 or 3′ of growth) as they will continue to grow from the terminal end of the prior years growth and flower on new growth. If left un-pruned they will become a tangled mass of bare vines with flowers only along the farthest end of each vine. When Your Packaged Clematis Plants Arrive – Remove from shipping package and check for any damage to poly bag protecting root and media. If you do not plant within 1 week of receipt, check media surrounding root for moisture. If dry, add enough water to re-moisten without soaking. Your clematis can be stored indoors for several weeks. If storing outdoors, try to keep from excessive heat (as an example – do not store in direct sunlight on concrete or pavement). When Your Trees Arrive – Open and check for moisture. If the packing material is dry, add enough water to re-moisten (without soaking). and reseal package until ready to plant. Your plants can be stored in cool temps (24-42F) for up to 2 weeks. Dig a hole 18″ deep and 18 — 24″ wide. Mix approx 1 part compost to 3 parts of the soil removed from hole. Return some of this mix to hole forming a mound. Spread roots over mound and place plant so that the shrub is about the same depth as it was in the nursery. Fill hole with your amended soil to within 2″ of the ground surface. Tamp soil firmly and fill hole with water and allow it to soak in. Finish filling hole to surface level and mulch with an organic mulch. When applying mulch after planting, make sure it is not piled up against the trunk. Does best in a semi protected location. Partial sun to shade, especially when young. If possible, choose a sight that has some protection from strong winds. Acer palmatum prefers well drained soil so augment your soil if needed. Also does very well in containers! Once mature they will thrive in full sun everywhere but the southernmost reaches of its hardiness range (Zone 8). Can be successfully transplanted to a better location easily if needed in the first few years. Late summer to early fall before frost is the best time. Once properly located and mature, these are drought tolerant but do not let them dry out when young during dry spells. Select a location with full sun and well drained soil if possible. Do not plant too deeply. Water liberally the first few weeks and monitor to make sure soil is moist during the first growing season. Once established, water deeply every other week during hot summer months of drought. A balanced fertilizer can be applied in spring once established. This should be applied before the main flush of growth appears. Any pruning should be done in late spring or early summer. Cut off any dead, diseased or damaged wood. Prune at its intersection with the main branch or trunk. Remove branches that are downward-growing, low-growing or that are rubbing against other branches. The canopy can be thinned out as needed to improve air circulation. This helps prevent disease. Redbuds are happy in either full sun or a semi-shaded area. It is best to plant at least 6-8′ away from any structure. Do not plant in an area that is constantly wet. They do well in many soil types and don’t need much fertilization. If pruning for shape, make cuts after the tree has finished blooming but before it has leafed out completely, generally around mid-April. Any dead, dying or diseased branches are best removed during winter dormancy. This is also a good time to remove any crossing, crowded or sucker branches. Plant your kousa dogwood in full to partial sun. They prefer moist well drained acidic soil if possible. Because of their shallow root system they don’t tolerate drought conditions well so make sure to mulch and water at least once a week during hot summer months. Light fertilizing can be done in early spring. Kousa dogwood seldom need pruning. Remove any dead, dried, broken or crossing branches from March to April. You may also thin the canopy of a mature tree if necessary to improve air circulation and sun exposure. You will obtain best flowering if planted in full sun. Flowering crabs are adaptable but do best in well drained somewhat acidic soil. Once established they are fairly drought tolerant. A balanced fertilizer can be applied in spring once established. This should be applied before the main flush of growth appears. Traditionally most pruning has been done in late spring or early summer after flowering. However it may be best to prune in late winter/early spring to protect from disease/bacteria entering through fresh open cuts during growing season. If you choose to prune during winter, be careful to preserve as many flower buds as possible. Remove branches that are downward-growing, low-growing or that are rubbing against other branches. Any dead, diseased or damaged wood should be removed as soon as possible. Prune cleanly at its intersection with the main branch or trunk. When Your Vine Arrives – Open and check for moisture. If the packing material is dry, add enough water to re-moisten (without soaking). and reseal package until ready to plant. Your plants can be stored in cool temps (24-42F) for up to 2 weeks. Dig a hole 12″ deep and 12 — 18″ wide. Mix approx 1 part compost to 3 parts of the soil removed from hole. Return some of this mix to hole forming a mound. Spread roots over mound and place plant so that the shrub is about the same depth as it was in the nursery. Fill hole with your amended soil to within 2″ of the ground surface. Tamp soil firmly and fill hole with water and allow it to soak in. Finish filling hole to surface level and mulch with an organic mulch. Your vine prefers well drained moderately fertile soil. Once established they are drought tolerant. Wisteria will thrive in full sun to partial shade but will flower better in full sun. Can be planted along walls, fences, pergolas, arbors, through a large tree or against rock faces. Wisteria do require regular pruning to control size and shape, especially in warmer climates. Vigorous pruning also promote flowering! TO PRUNE AS A TREE: Start young and remove all the extra stems, leaving only one strong central leader. Control all sucker growth from around the base of the plant. You can shape it as this grows. When central leader reaches desired height, prune or “top it off” Control new growth around lower trunk and any shoots from the roots allowing only growth from top of trunk. These will form the canopy of your tree. When Your Packaged Vine Arrives – Remove from shipping package and check for any damage to poly bag protecting root and media. If you do not plant within 1 week of receipt, check media surrounding root for moisture. If dry, add enough water to re-moisten without soaking. Your vine can be stored indoors for several weeks. If storing outdoors, try to keep from excessive heat (as an example – do not store in direct sunlight on concrete or pavement). When Your Strawberry Plants Arrive – Open and check for moisture. If the packing material is dry, add enough water to re-moisten (without soaking). and reseal package until ready to plant. Your plants can be stored in cool temps (24-42F) for up to 2 weeks. Planting – Soak your plants for 20-30 min. before planting. Do not let the plants dry out when planting, keep covered at all times. Trim off about 1/3 of the root length on each plant and remove any old leaves that may be on the plants. Dig your holes so that your berries can be planted in rows with 18-24″ between plants. If setting in rows, leave enough room to work (at least 3′) between rows. Mix approx 1 part compost to 3 parts of the soil removed from hole. Spread the roots out in a fan shape and using your amended soil, plant so that the crown or bud is at ground level, not deeper. New growth starts from this crown in the center of the plant. Press loose soil firmly around the roots and water well. Care – Frequent and shallow cultivation is best. Keep the top soil loose. June Bearing varieties should have their blossoms cut off during the first year to make a strong vigorous plant for the next years production. Everbearing varieties can have their blossoms left on after July 15th. A winter mulch of about 1 1/2″ is a good idea. Do not mulch around the crown of the plant – this may cause rot. Apply the mulch just after the first hard fall freeze and remove in the spring before new growth starts. A good source for information and recipes. When Your Packaged Strawberry Plants Arrive – Remove from shipping package and check for any damage to wrap protecting root and media. If you do not plant within 1 week of receipt, check media surrounding root for moisture. If dry, add enough water to re-moisten without soaking. Your strawberries can be stored indoors for several weeks. If storing outdoors, try to keep from excessive heat (as an example – do not store in direct sunlight on concrete or pavement). When Your Blueberry Plants Arrive – Open package and check roots for moisture. If they appear dry, add enough water to re-moisten and reseal package until ready to plant. Your blueberry plants can be stored in cool temps (34-42F) for up to 2 weeks. Planting – Your blueberries prefer an acidic soil with pH range of 4-4.5. If you have loose, loamy soil this can be achieved by adding peat moss, compost or compost & manure. If your soil is a heavy clay, you may need to add garden sulfur, aluminum sulfur or iron sulfate. Before planting, soak your plant in water for 2-6 hours, making sure the roots are submerged and kept damp until they are planted. Dig your hole 18″deep x 18″wide so that the roots can be spread without cramping them. Mix about 1 part organic compost to 2 parts soil removed from hole. If you are planting just a few blueberries, space them roughly 4-5′ apart. If you are planting in rows, separate your rows by at least that much. Make sure the roots are spread out in the hole and completely covered in the soil mix. Mulch after planting with an organic mulch Evergreen wood chips, pine needles or sawdust all work well and will help keep the soil acidic. Water well. Care – As blueberries tend to have shallow root growth, it is important to keep them watered (including a deep watering at least 1 time per week) and mulched. Do not fertilize the first year as the new root growth will be sensitive. Once established use any fertilizer geared toward acid loving plants (blueberries, azaleas, hollies etc.). Pruning – Pruning is necessary after the third year to prevent overbearing and to maintain maximum fruit size. Remove low-spreading branches at ground level and at least 1 older cane in addition to any weak or broken ones. Fruit is borne on branches in their 2nd year so your pruning should be geared towards promoting healthy 2nd year branches. If you desire your bushes to reach maximum production as soon as possible, it is best practice to remove the flowers in the first 2 years. In the long run, you will have a more vigorous and productive plant by sacrificing the smaller crops you would receive from a young bush. For more information & recipes. When Your Packaged Blueberry Plants Arrive – Remove from shipping package and check for any damage to poly bag protecting roots and media. Any breakage to plan canes may be cut back to just below damage. The plant roots will eventually send out new growth. If you do not plant within 1 week of receipt, check to see if media around roots needs water. Plant can be held indoors for several weeks. If storing outdoors, try to keep from excessive heat (as an example – do not store in direct sunlight on concrete or pavement). When Your Raspberry Plants Arrive – open package and check roots for moisture. If they appear dry, add enough water to re-moisten and reseal package until ready to plant. Your raspberry roots can be stored in cool temps (34-42F) for up to 2 weeks. Planting – Raspberries love moisture so soak the roots for 2-6 hours before planting. Dig your hole large enough so that the roots can be spread out without cramping. Do not plant your raspberries in the same spot where you recently planted fruits or berries. If you are establishing a large planting, spread 3′ apart and in rows 6-8′ apart in full sun. If a trellis is going to be used install before plants show much growth. A trellis will support the canes and help with air circulation which helps prevent disease. If possible plant rows on a North South axis to allow more even sun coverage. Best to plant early in the spring. After planting, cut canes back to 8-10″ maximum height. Mulch with a 2-3″ layer of organic mulch. This helps conserve moisture and suffocates weeds. Water liberally especially if there is little rain, till well established. Pruning – Once established, the roots send up an abundance of shoots or canes in the spring. By trimming off the majority of these, the remaining canes will produce lots of berries. If left untrimmed your neat rows will become a thicket. Red June Bearing – Plants produce berries on two year old canes wile the one year old canes grow next to them. The two year canes have brown stems while the young ones are green. Prune the older canes only after they have finished fruiting. Prune in the fall, leaving about 6 of the thickest, strongest green ones. Keep your plants confined to a space approx 20″ wide, cutting off all canes that grow sideways. Black and Purple June Bearing – Plants must also be pruned every year. However, contrary to red raspberries, pinch back the new canes at about 30″ early in the summer. This will force the canes to produce side branches. Early the next summer cut these side branches back to 12-15″. Remove these older canes in the fall leaving the new canes just as with the red June Bearing. Everbearing – Plants bear fruit in the fall on canes produced in the spring of that year. The same canes that produced in the fall bear fruit the following summer. Therefore, after harvesting the June crop, remove these older fruiting canes, leaving the new canes for fall production and fruiting the following summer. For additional information and recipes. When Your Packaged Raspberry Plants Arrive – Remove from shipping package and check for any damage to poly bag protecting roots and media. Any breakage to plant canes may be cut back to just below damage. The plant roots will eventually send out new growth. If you do not plant within 1 week of receipt, check to see if media around roots needs water. Plant can be held indoors for several weeks. If storing outdoors, try to keep from excessive heat (as an example – do not store in direct sunlight on concrete or pavement). When Your Grape Plants Arrive – Open package and check roots for moisture. If they appear dry, add enough water to re-moisten and reseal package until ready to plant. Your Grape plants can be stored in cool temps (32-42F) for up to 2 weeks. Planting – It’s best to plant your grapes in a sunny open area to allow good air flow. This will help prevent disease. In northern climates, sloped ground will help protect from frost. Well drained soil is best. Ideal spacing for multiple plants is 6-10′. If you are using a trellis or arbor, it is best to have it ready to go. Before planting, soak your plant in water for 2-6 hours, making sure the roots are submerged and kept damp until they are planted. Dig your hole 12″deep x 12″wide so that the roots can be spread without cramping them. Mix about 1 part organic compost to 2 parts soil removed from hole. Trim any broken roots and using your amended soil mix, back fill hole and set vine so that it is about the same depth it was in the nursery. Fill hole to within 2″ of the ground surface and tamp soil firmly. Fill hole with water and allow it to soak in. Finish filling hole to surface level and mulch with an organic mulch. It’s best to prune the top back to a maximum of 2 or 3 buds. Care – Do not fertilize in the first year. Fertilize lightly in the second year of growth. Keep well mulched and well watered. To ensure your vine establishes a good root system to support heavy crops, it is best practice to remove the fruit when it first appears during the first 2 years. This sacrifice will help provide years of long term gain. Pruning – Remember, grapes are vines and left un-pruned will not only produce much less fruit (as they bear only on new growth), but will become unsightly. Your grapes should be pruned every year when they are dormant, before the buds start to swell and after any winter damage has occurred (Feb-April depending on location). During first pruning, select 2 or 3 strong canes, fasten these to your support and cut back all the rest. In the second pruning, cut back all but 4 or 5 (depending on your support system). These remaining “arms” should be pruned to leave 2 or 3 healthy buds. Remember during the first 2 years to remove the flower/fruit growth as it appears. Thereafter, each pruning, leave 4 or 5 “arms” each with 5-8 buds. These well-established vines will now produce bountiful harvests on each year’s new growth. When Your Packaged Grape Plants Arrive – Remove from shipping package and check for any damage to poly bag protecting roots and media. Any breakage to plant may be cut back to just below damage. If you do not plant within 1 week of receipt, check to see if media around roots needs water. Plant can be held indoors for several weeks. If storing outdoors, try to keep from excessive heat (as an example – do not store in direct sunlight on concrete or pavement). When Your Blackberry Plants Arrive – Open package and check roots for moisture. If they appear dry, add enough water to re-moisten and reseal package until ready to plant.Your blackberry plants can be stored in cool temps (34-42F) for up to 2 weeks. Planting – Blackberries like well drained, rich moist sandy soil in full sun. Soak your plant in water for 2-6 hrs. before planting and keep the roots covered and damp until planting. Dig your hole 18″deep x 18″wide so that the roots can be spread without cramping them. Mix about 1 part organic compost to 2 parts soil removed from hole. Plant your blackberry with the root crown at the soil surface level and the roots spread out no more then 4″ deep. Use the amended soil to fill the hole, tamping to eliminate air pockets and water well. Mulch with 2-3″ of organic mulch to help prevent weeds and to help retain moisture. Trim each cane back to about 6″. If you are establishing a large planting space your plants every 5′ with 8′-10′ between rows. Keep well watered till plants are established. Pruning – After harvest prune old or dead canes from your plant. Make cuts near the crown and clean up any debris from the soil. Remember to remove all old or dead material from your berry patch. Prune damaged or weak canes as well, leaving at least 4-8 new shoots on each cane. Remove the tips of the current season’s growth to encourage lateral branching. In the spring, before the new growth forms, prune the lateral branches back to about 12″ to help encourage fruit production. Prune off root suckers (which grow from the crown of the plant) when they are about 1′ so they don’t steal nutrients from the rest of the plant. When Your Packaged Blackberry Plants Arrive – Remove from shipping package and check for any damage to poly bag protecting roots and media. Any breakage to plant canes may be cut back to just below damage. The plant roots will eventually send out new growth. If you do not plant within 1 week of receipt, check to see if media around roots needs water. Plant can be held indoors for several weeks. If storing outdoors, try to keep from excessive heat (as an example – do not store in direct sunlight on concrete or pavement). When Your Plants Arrive – Open package and check roots for moisture. If they appear dry, add enough water to re-moisten and reseal package until ready to plant. Your plants can be stored in cool temps (34-42F) for up to 2 weeks. Care of Currants – Keep plants mulched and watered as they prefer cool, moist soil. You may want to net your plants to protect your berries from the birds. Red Currants – Harvest by cutting the whole bunch of berries when they are large and firm (around mid summer). Black Currants – Do not harvest too soon. Once ripened let the berries hang on the bush a few extra days for maximum flavor! When you see the first few start to fall off the bush on their own, they are ready. Red Currants – Pruning should be done in the early spring. In the 2nd year remove all but 4-5 of the new shoots and 3-4 of the year old branches. Every spring after that prune so that the plant has 3-4 1yr old shoots, 3-4 2yr old branches and 3-4 3yr old branches. Black Currants – Pruning should be done in winter. After the first growing season remove the most spindly branches and select 1 strong branch and cut this back to soil level. Thereafter, remove about 1/4 of the 2 yr old branches (grey in color) and any older branches (black in color). Cut these off at soil level. It is also a good idea to take out branching that grow at sharp angles away from the main bush. Care of Gooseberries – After the first year of growth, during the late winter, you can fertilize with a balanced fertilizer. Look for one with lower nitrogen and higher potassium levels. Water in the mornings to allow plant leaves to dry before evening. Keep mulched. Gooseberries start out green and turn purple as they ripen. It is recommended that you harvest twice. In June, gather approx 1/2 the under-ripe tart green berries for jams, pies, tarts and sauces. This will also allow the remaining berries to become larger and sweeter for fresh eating. Keep plants well watered while berries are ripening. You may want to net your plants to protect your berries from the birds. Pruning Gooseberries – Proper pruning is important to keep you plant healthy and manageable. In the winter, prune out any dead or diseased stems. Thin out any overcrowded areas by taking out drooping and crossing branches. Shorten the new growth by half to maintain an acceptable size. Berries grow on 2 and 3 year old branches. Older branches are unproductive and should be removed. When Your Elderberry Plants Arrive – Open package and check roots for moisture. If they appear dry, add enough water to re-moisten and reseal package until ready to plant. Your elderberry plants can be stored in cool temps (34-42F) for up to 2 weeks. Planting – Elderberries will tolerate all soil types. Well drained loamy soil is always best if available. Soak your plant for 2-6 hours before planting and keep roots covered and damp till planting. Dig your hole 18″ wide and about 12″ deep. Mix about 1 part organic compost with 2 parts soil removed from hole. Fill the hole about halfway with your amended soil mix. Place your elderberry on top of this soil spreading roots out so that they are not bent or cramped. Your plant should end up about 2″ deeper than it was grown in nursery. Fill the hole at least 2/3 to top and firmly tamp soil around roots. Fill hole with water and let drain. Finish filling hole with soil mix, water again and cover hole with 2-3″ of a good organic mulch. Be sure to plant 2 varieties to achieve good fruit production! Care – Make sure to keep your elderberries watered during dry spells! The shallow root system do not tolerate drought conditions well, so keep plant watered and mulched. Do not fertilize the first year. It is best to only prune dead or broken branches the first 2 years, letting your plant grow. Starting the 3rd year you can prune in early spring, removing dead and broken branches and any shaping you desire. After the first year, you can fertilize lightly in early spring. Pick your berry clusters as soon as they ripen in the late summer! If you are not careful, the birds will get them first! When Your Asparagus Roots Arrive – Open and check for moisture. If the packing material is dry, add enough water to re-moisten (without soaking). and reseal package until ready to plant. Your plants can be stored in cool temps (24-42F) for several weeks. Plant – Select a sunny location with well drained soil. Asparagus prefer a neutral pH (6.0 – 7.0). If necessary work the soil with organic compost before planting. Dig a trench 10-12″ deep and about 10″ wide. Mix approx 1 part compost to 3 parts of the soil removed from trench. Return about 3-4″ of the amended soil into the bottom of the trench. If more than one row is planted, keep them about 4′ apart. Plant roots at the bottom of the trench spaced 18-24″ apart. Spread the roots so they lay flat and make sure the top of the crown is covered with 2″ of your soil mix. Do not fill the whole trench at this time. As the plants sprout, fill trench gradually until the soil is level with the ground. Care – Regular watering is important, especially in the first few years while your bed is getting established. Early each spring It is a good idea to weed and top dress your bed with compost or mulch. The old growth needs to be removed each year before the new growth starts. This can be done in fall or early spring. Harvest – It is not recommended that you harvest any tips in the first year. Starting the second year, you may cut a few tips using a sharp knife and after the third year, regular cuttings can be made. You can cut until the temps get warmer and your spears start to look spindly. Allow the plants to grow and produce foliage, this will help strengthen the roots for next years crop. When Your Packaged Asparagus Plants Arrive – Remove from shipping package and check for any damage to poly bag protecting root and media. If you do not plant within 1 week of receipt, check media surrounding roots for moisture. If dry, add enough water to re-moisten without soaking. Your asparagus can be stored indoors for several weeks. If storing outdoors, try to keep from excessive heat (as an example – do not store in direct sunlight on concrete or pavement). When Your Rhubarb Roots Arrive – Open and check for moisture. If the packing material is dry, add enough water to re-moisten (without soaking). and reseal package until ready to plant. Your rhubarb roots can be stored in cool temps (24-42F) for several weeks. Planting – Dig a hole about 18′ deep x 18″ wide for each root. Mix about 1 part organic mulch to 2 parts of the soil you removed from hole. Return this mix to your hole and place roots small end down in the loose soil with the tops just covered. Mulch with 1-2″ of organic mulch and water well. Care – Water well during summer months and keep mulched. Do not use a chemical fertilizer in the first year of growth as the high nitrates can damage your plants. Remove the seed stalks when they appear. Starting the 2nd year you can apply a light dose of fertilizer early in the spring. It is recommended that you dig a portion of your roots every 3 or 4 years and divide. This should be done when dormant, early spring or late fall. Replant your bed and start a larger planting or share with a friend! Harvest – It is highly recommended that you do not harvest any stalks the first year. This will help get your bed established. Starting the 2nd year you can cut stalks that reach 12 to 18″ (remove and discard the leaves). When stalks become thin, stop harvesting for the season. After the 3rd year, you should be able to harvest for 8-10 weeks! Be sure to discard the leaves as they are poisonous. When Your Horseradish Roots Arrive – Open and check for moisture. If the packing material is dry, add enough water to re-moisten (without soaking). and reseal package until ready to plant. Your horseradish roots can be stored in cool temps (24-42F) for several weeks. Plant -Tolerant of most any soil type, avoid waterlogged areas. Dig hole about 8″ deep x 8″ wide. Mix approx 1 part compost to 3 parts of the soil removed from your hole. Fill hole about half way with your amended soil. Set your horseradish roots at a 45 degree angle, small end down and refill hole with the large end of roots laying 2-3″ below the surface. Space your roots about 12″ apart. Water well and top dress with an organic mulch. Care – Water once per week during dry spells. Roots set out in the spring are harvest size in the fall. Delay harvesting until October or November as Horseradish makes its greatest growth in late summer and early fall. Carefully remove soil from around the roots. There will often be a main root and several smaller ones in a cluster. You can replant these smaller roots for harvest the next season. Scrub the roots you want to harvest under running water and dry well. Kept in a perforated bag, you can keep these roots in your refrigerator vegetable bin for months! When Your Packaged Rhubarb Plants Arrive – Remove from shipping package and check for any damage to poly bag protecting root and media. If you do not plant within 1 week of receipt, check media surrounding roots for moisture. If dry, add enough water to re-moisten without soaking. Your rhubarb can be stored indoors for several weeks. If storing outdoors, try to keep from excessive heat (as an example – do not store in direct sunlight on concrete or pavement). When Your Packaged Horseradish Plants Arrive – Remove from shipping package and check for any damage to poly bag protecting root and media. If you do not plant within 1 week of receipt, check media surrounding roots for moisture. If dry, add enough water to re-moisten without soaking. Your horseradish can be stored indoors for several weeks. If storing outdoors, try to keep from excessive heat (as an example – do not store in direct sunlight on concrete or pavement).